A storm in the eastern U.S. is bringing mainly heavy rain to half of the nation this weekend. On Friday, over 2 inches of rain fell in parts of South Carolina, with flooding reported there and some minor flooding reported in parts of Florida as well. The radar is showing several areas of very heavy rain Saturday morning from Missouri to Washington, D.C., and south to Florida. Heavy rain, and in some locations a melting snow pack, could cause some flooding through the weekend. Rainfall rates of 1 to 2 inches per hour will be possible. Flood alerts have been issued for a large part of the East Coast, including Raleigh, North Carolina, and Washington, D.C. The storm is a slow mover, which could enhance rainfall totals in some spots. By Sunday morning, rain will still be falling in parts of the Northeast. However, rain moving into parts of interior New England could mix with or transition to snow during the morning hours. Little to no accumulation is expected, but some slick spots are possible in the interior Northeast on Sunday morning. By Monday morning, colder air wrapping around the storm should bring a quick round of snow to parts of the interior Northeast again. It is likely that accumulations will be very limited with the best chances for accumulation located in the higher elevations south of Albany, New York. The other notable mention with this system is that this latest storm is bringing more rain to a region of the country that is already breaking annual records. 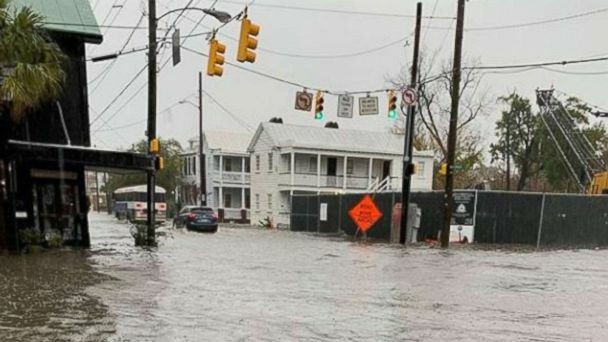 Heavy rain is falling in Wilmington, North Carolina, on Saturday morning, which has already observed its wettest year on record. As of 11 p.m. Friday, Wilmington had received 99.68 inches of rain in 2018. A large amount of this rainfall came from Hurricane Florence in September. The previous record was 83.65 inches in 1877. Washington, D.C., is also seeing heavy rain Saturday morning. The city has already seen 61.06 inches of rain in 2018, making it the second-wettest year on record. With another 1 to 2 inches of rain forecast, D.C. will almost certainly break the annual record of 61.33 inches set in 1889. Strong winds on Friday night caused over 100,000 power outages in northwest Washington, some of those in the Seattle area. Wind were reported to be close to 50 mph at times. Behind the gusty winds, a storm is moving into the Northwest by Saturday night which will bring mainly heavy rain and some mountain snow. The heavy rain will stretch down to parts of California as well. Another low is lurking right behind this system that will bring the next round of rain to the region for Tuesday and Wednesday. Some flooding is possible in parts of the West with this second system. Rainfall totals in parts of the western U.S. through Wednesday could exceed 5 to 6 inches. However, much of the Pacific Northwest is used to seeing rainfall in this fashion during the colder months. In parts of the Sierra Nevadas, mountain snow of 1 to 2 feet is possible through Monday.